Facebook plans to ramp up video investment throughout the rest of the year as it looks to differentiate its offering from rivals like YouTube by focusing on personal connections. Speaking on the company’s first quarter earnings call, CEO Mark Zuckerberg said that while passive video consumption is down on the site – a result of recent tweaks to how the Facebook prioritises content – it is stepping up efforts around interactivity. “We’re trying to make a different experience than what you might be able to get on YouTube or any of these other services by making it more about connecting with people in different ways,” said Zuckerberg. He claimed that Watch Party, a new feature designed to let groups of people watch and content and interact, is something that Facebook is uniquely positioned to build. Interactivity also ties in with Facebook’s video commissioning strategy for its Facebook Watch platform. Asked whether Facebook had invested much on video content in the first quarter of the year, CFO David Wehner said, “It’s clearly going to be more weighted towards the rest of the year”. 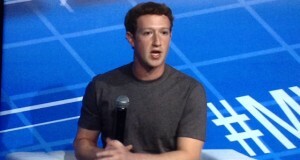 However, he also said that Facebook’s gross margin declined slightly, in part because of video content investment. The comments came as Facebook reported strong revenue and earnings growth, despite the recent Cambridge Analytica scandal, which broke two weeks before the end of Q1, and the resulting scrutiny of Facebook’s data and privacy policies. Sandberg also played down the suggestion that Facebook might try and follow in the footsteps of media rivals like Netflix or Spotify by exploring a subscription model. For the quarter Facebook reported a 49% year-on-year increase in revenue at US$11.97 billion. Net income rose 63% to US$4.99 billion. Commenting further on Facebook’s focus on building relationships, he said: “This quarter we’ve continued shifting from passive consumption to encouraging meaningful interactions. It’s still early, but we’re starting to see some signs that this is working.